They're known as Danger Dogs, Death Dogs, Alley Dogs, Heart Attack Dogs, Mexican Dogs, Cart Dogs, or Tijuana Dogs, but devouring an L.A. Street Dog is worth every risk! 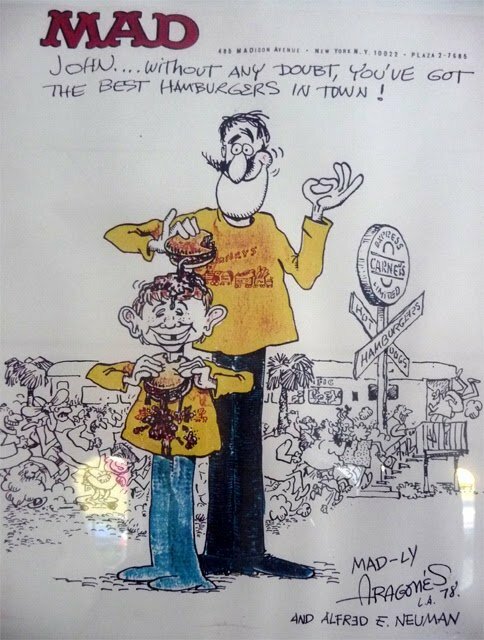 I've had them from a wobbly-wheeled pushcart in MacArthur Park; served by a sidewalk hawker after a Hollywood Bowl concert; and as a tasty hangover vaccine while sitting on the curb in the early a.m.. 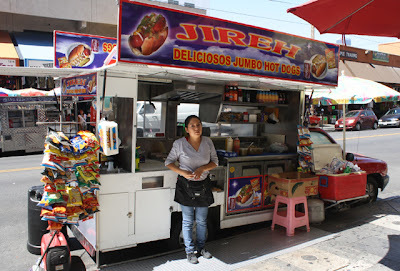 In my hunt for the quintessential L.A. Street dog, I discovered that the greasy heart of the L.A. street-cart scene lies in the bustling, pedestrian-friendly Fashion District of Downtown L.A. 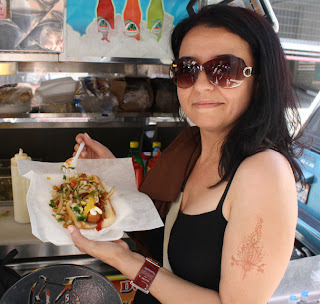 In this concluding video post of my August Hot Dog Month series, I go prowling there on a dog day afternoon, then return to my kitchen to show you how to make your own flavor-packed street-style wiener -- a safer alternative for the squeamish. The L.A. Street Dog's origins are south of the border. While a bacon-wrapped hot dog does not connote Latin flavors, this cart food has the head-turning, stop-in-your-tracks grilling aroma that all classic street food strives for. And it takes an unorthodox palate to combine mustard, ketchup AND mayonnaise -- it should'nt work, but the multifarious flavors are pitch perfect - sweet ketchup, sour mustard and creamy mayo. Adding a fajitas mix of grilled onion, bell pepper and a hot jalapeno makes this like an IED detonating on your tongue. This is one delectable hot mess! In downtown L.A. I zoomed past flag-waving parking attendants luring drivers into $5 lots, and parked on San Julian Street, just South of Pico Boulevard (click here) for metered parking at $1 per hour, and walked up to 12th Street and Maple Avenue (click here) -- an area with more hot dog carts per square block than anywhere else in Los Angeles. The carts do a brisk business from all the clothing stall employees, shoppers, and tourists. A street-smart tip: look for carts that offer the extra topping of fresh chopped pico de gallo (onion, tomato, cilantro and avocado marinated in lime juice). The grilled, plump, bacon-wrapped wieners are jumbo-sized; and at $3 each, they're the right price for this cast iron-stomached chintzy chef. 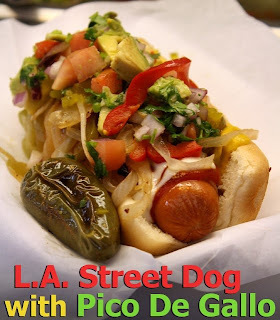 So don't stop here - click on the video below, in which I lead you through the tangled downtown streets to show you where to get L.A.'s best street dog. 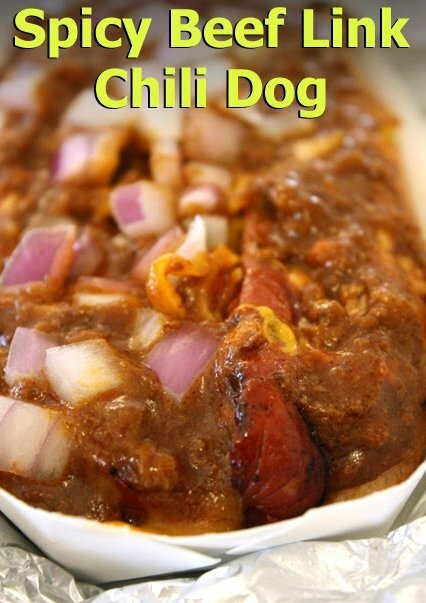 Lastly, scroll down to read my step-by-step L.A. Street Dog Recipe. This concludes my epic summer hot dog series - next month, it's back to salads and fruit smoothies for this heavier, Artery - clogged Epicurean, so enjoy this final encased-meat indulgence. And have a happy Labor Day weekend! 1 large jalapeno - or more, to your taste. If you use from jar or canned, drain well. 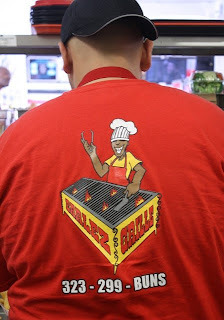 On a heated grill or frying pan, saute chopped onion, bell pepper and jalapeno over medium heat. 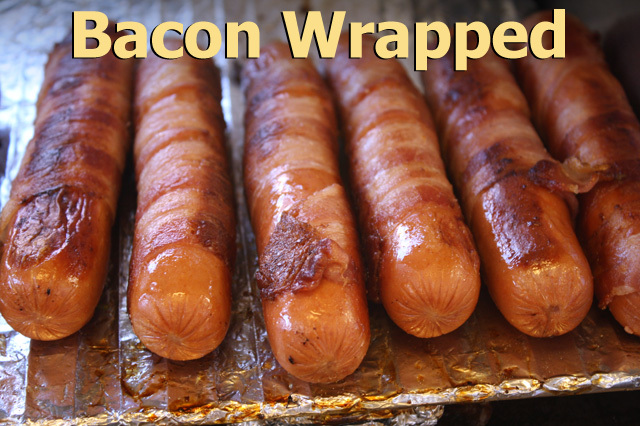 Bacon wrap the wiener, fastening with toothpicks if necessary. 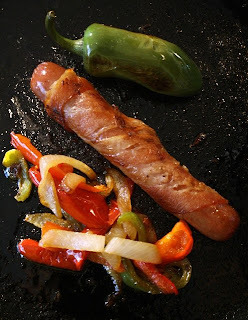 If pan is large enough, add the bacon-wrapped dog alongside the grilling veggies. The bacon grease just adds flavor. Cook until bacon is browned on all sides, and veggies are soft and caramelized, including the jalapeno -- about 10 -15 minutes. (The jalapeno becomes milder and sweeter when well-browned during sauteing.) If you cook veggies separately, add a teaspoon of oil for grilling. 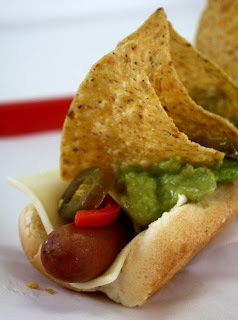 During the last minute, push aside veggies and hot dog, and grill (optional) an open-faced hot dog bun. 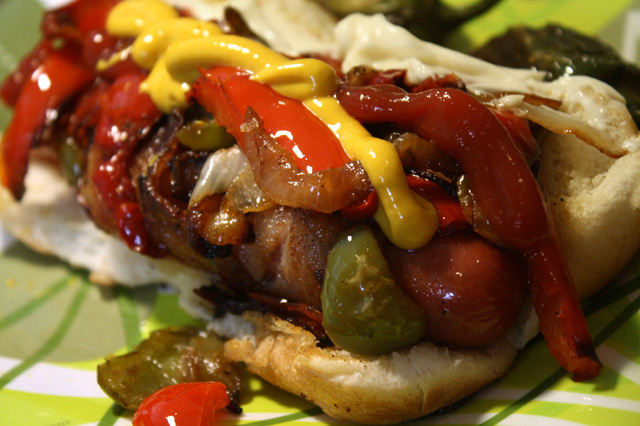 To assemble, add bacon-wrapped hot dog to bun and slather on mayo, mustard and ketchup. Finally, top with grilled fajita mix and add the jalapeno. You can saute extra veggies, jalapenos, and bacon-wrapped wieners for an L.A. Street Dog Party! 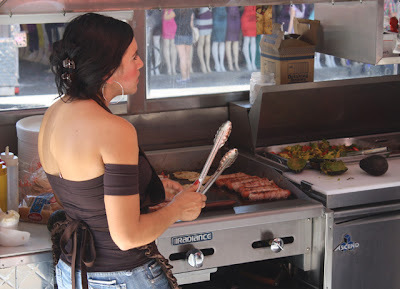 99 thanks to the Fashion District Hot Dog Carts, and Bob McGinness for his kitchen camerawork! The 99 Cent Chef may have bitten off more than he can chew this time! 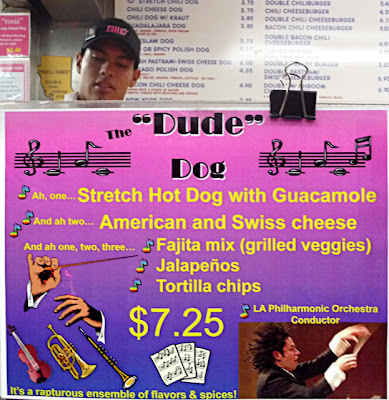 How do you make a video that combines dynamic Venezuelan conductor Gustavo Dudamel, a "Dude" hot dog (created by Pink's for our new Philharmonic conductor), and Gershwin's "Rhapsody In Blue?" Only one chef would have the cojones to do it -- I'll let you decide if I've succeeded. I've been looking forward to seeing Gustavo Dudamel since he became music director of the L.A. Philharmonic in 2009. The young conductor from "The System" in Venezuela (which teaches young kids the joys and hard work of symphonic music) has charisma and is camera ready for seen-it-all L.A. audiences. 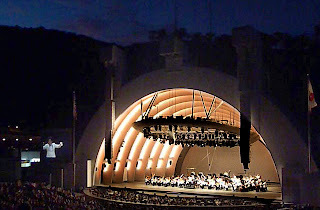 With his curly locks flying and his baton teasing, punching and slashing, he delivered a great night of Gershwin (and Leonard Bernstein) at the Hollywood Bowl on the third of this month. 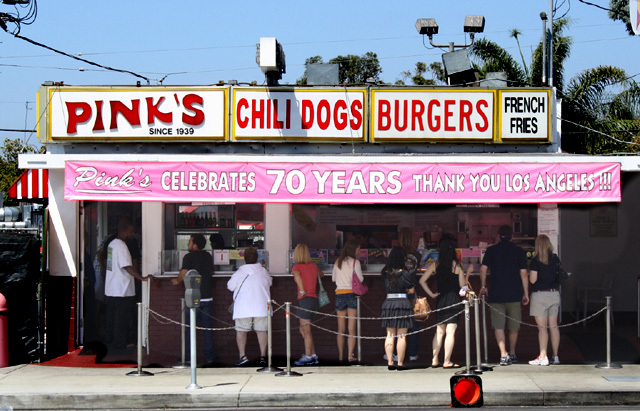 Pink's, L.A.'s most popular hot dog stand (the place can't put up all its celebrity headshots), was started in 1939 with just a pushcart, and has the longest lines of any diner, and deservedly so. It has been filmed and reviewed by every media outlet in L.A. so I won't repeat it all here. 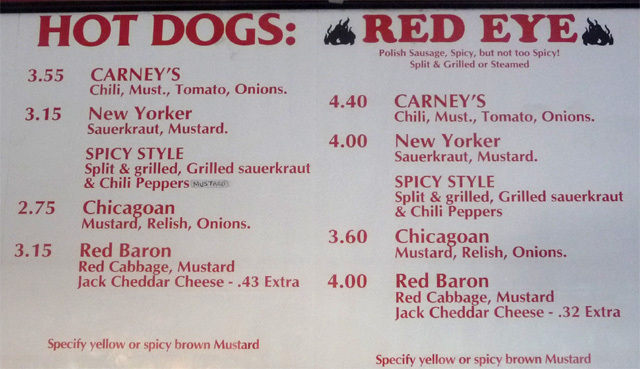 However, I did notice one special hot dog that has not been covered, and that is the "Dude." 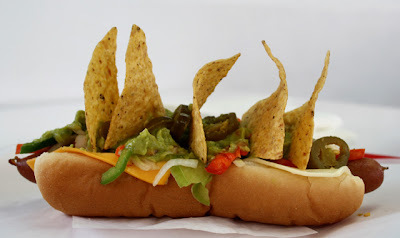 Created by manager Gloria Pink's husband Richard for Gustavo Dudamel, this is the most whimsical hot dog in L.A. With tortilla chips propped up on a 10-inch stretch dog, you would not be mistaken in thinking you are looking at a sailboat. 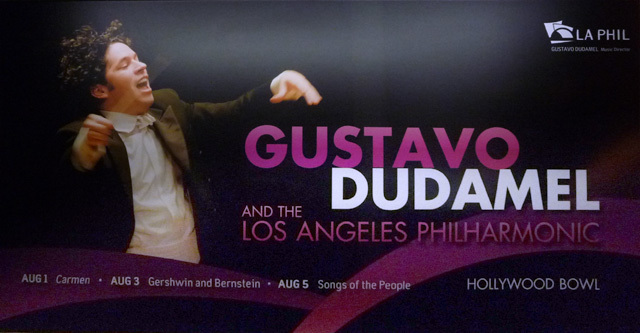 That's what Richard Pink had in mind -- Gustavo Dudamel carried from Venezuela to Los Angeles on a Pink's hot dog schooner at full mast! The Dude is made with Latin flavors. A grilled fajita mix of onions and bell peppers and a creamy guacamole sauce, topped with jalapenos and tortilla chips. 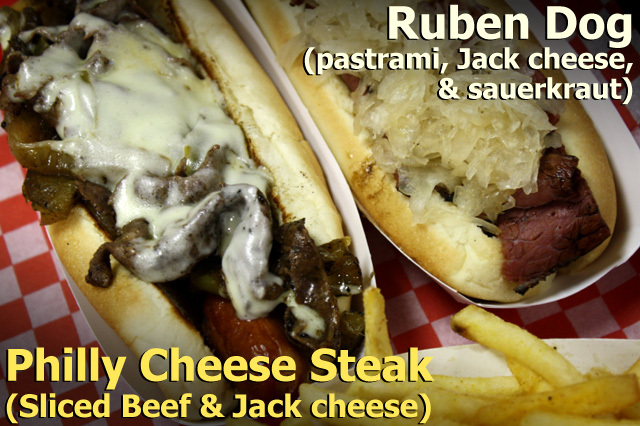 You also get American and Swiss cheese under a steamed 10-inch stretch dog. At $7.25, it's the equivalent of two hot dogs in one bun. Like the wailing clarinet glissando that opens Gershwin's "Rhapsody in Blue," swirling a tortilla chip in cool guacamole and spicy jalapeno slices makes your head and taste buds swim - not many hots dogs double as a bowl of guacamole dip! The guacamole is not the fresh hand-mashed type (there's a slight vinegar under-taste), but it is welcome when you are cymbal-hit with a spicy jalapeno slice. Try to resist eating off all the guac; the zenith is taking a big bite of this heady medley and letting all of the kaleidoscopic flavors envelope you. The grilled onions are cello-smooth, and the red and green bell peppers violin-sweet. The "stretch hot dog" is steamed just right, and when bitten, has the harp-string "snap" that all hot dog devotees pray for. Between bun and wiener are slices of American and Swiss cheese, adding a melting creamy crescendo. To enjoy my special video concerto, you can leave your suit, tie and jewelry behind --just pull up a chair, turn up the volume, and allow The 99 Cent Virtuoso to conduct the next few delectable minutes. Play it here. The video runs 3 minutes, 32 seconds. 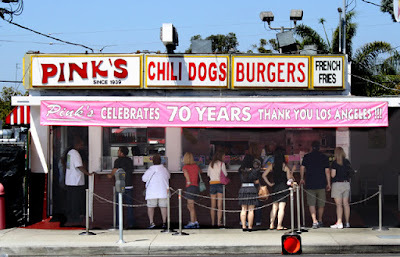 99 thanks to Pink's and The Hollywood Bowl! 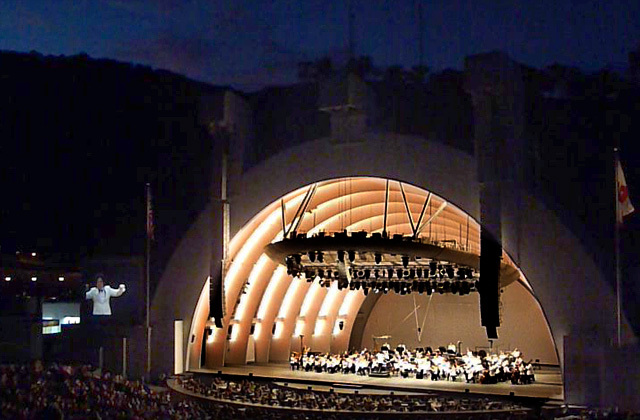 To see my two Hollywood Bowl Videos from last summer, click here. Upcoming videos include: Earlez Grille for hot dogs in South L.A.; a debauched Hot Dog Happy Hour at Carney's on the Sunset Strip; and a search for (and video recipe of) the L.A. Street Dog. To embed, or to just link from Youtube, click here. This week leave your hot dog, meat-eating, guilt on the curb. 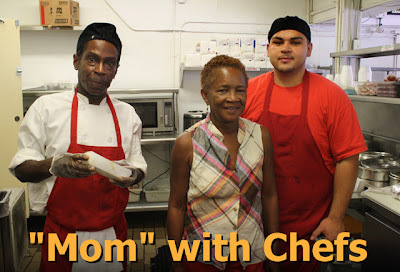 The 99 Cent Chef videos Let's Be Frank, which serves up wieners with compassion. 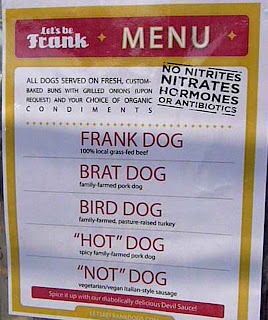 No factory farm beef, pork, or turkey are used in their franks. All the animals are 100% grass fed and humanely raised locally in California. Hormones, antibiotics, nitrates, and nitrites are not added in the production of the meat. 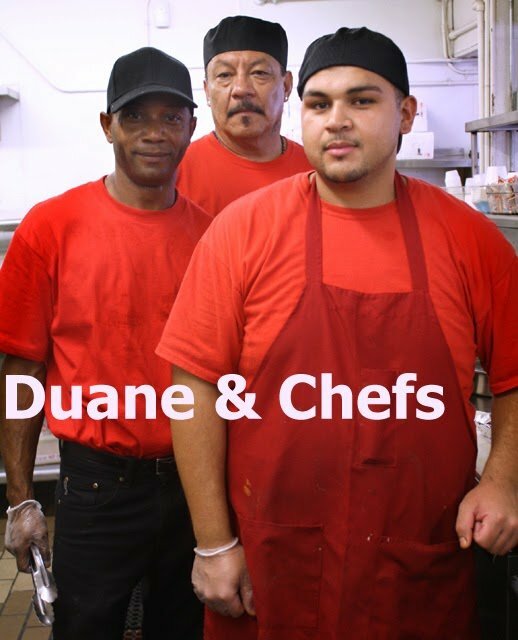 The owner, Sue Moore, was a former meat forager for Alice Waters' temple of locally sourced restaurant cuisine, Chez Panisse, in Berkeley, California. And the taste of these franks reflects her organic, artisanal creativity. 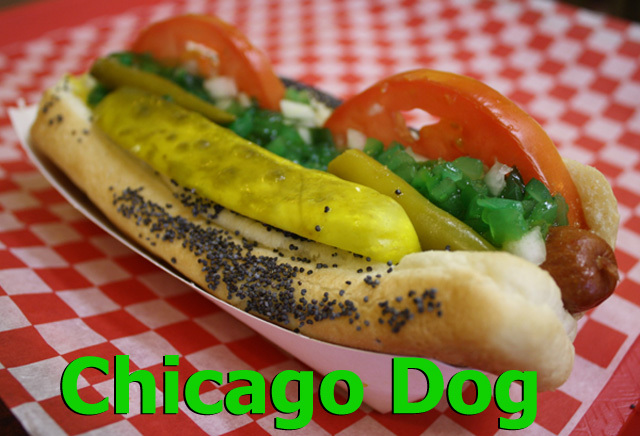 The natural casing dogs are somewhere between a coarse hand-ground Italian sausage and the smooth baloney texture of a normal hot dog. 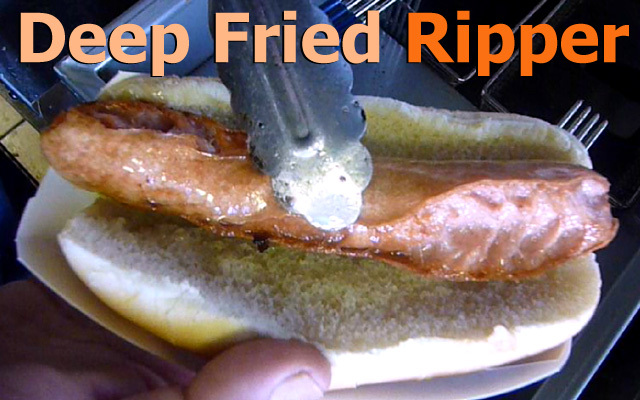 In my video, one of the customers compares the taste to a Bronx deli hot dog from 45 years ago! I shot my video at the Helms Building parking lot location in Culver City. 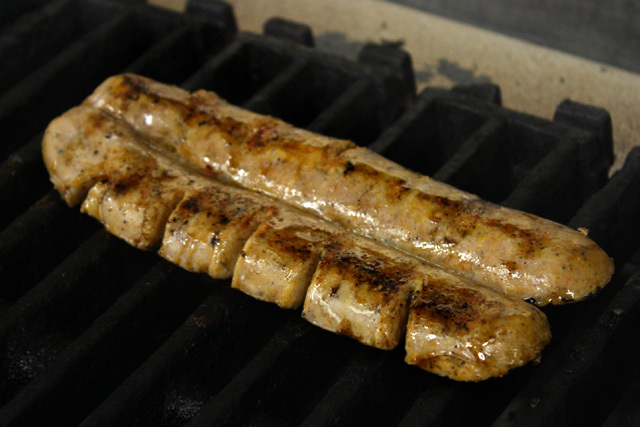 The links and buns are steamed, then grilled, and cost $5 -- that may seem a little high, but you get eight inches of tube steak, much longer than a normal hot dog. 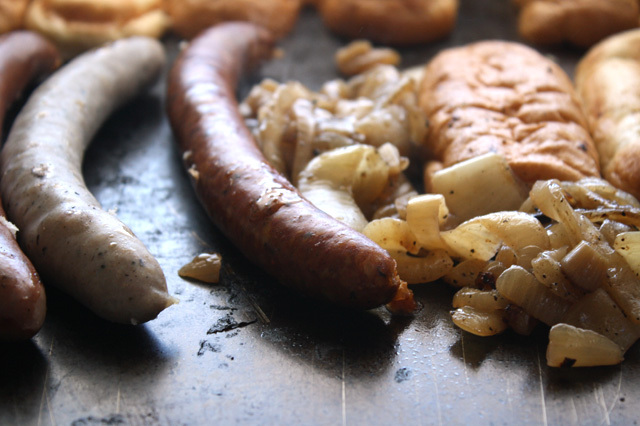 The organic condiments that go with an order include sauerkraut from Kruegermann (a local purveyor), homemade pickle relish, and grilled onions. There is also an Asian chutney-like hot and spicy Devil Sauce, made especially for Let's Be Frank. 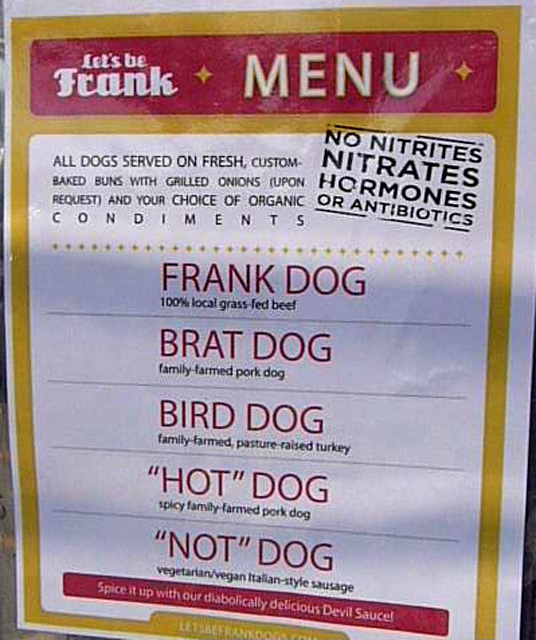 There are five franks to choose from: Frank Dog (beef), Brat Dog (pork bratwurst), Bird Dog (turkey), Hot Dog (spicy pork), and Not Dog (vegetarian). 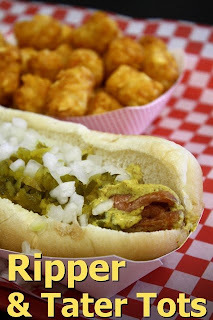 I really enjoyed the white pork juiciness of the Brat Dog, and didn't find the Hot Dog too spicy, even with Devil Sauce! I asked for grilled onions (they're cooked until almost caramelized) for both. The locally made Kruegermann sauerkraut and organic pickle relish is mildly sour, mixed with a slight sweetness -- crunchy and fresh tasting. You can order the wieners online, and I've found four-packs for sale at Surfas restaurant suppliers in Culver City. Click here for a complete list of other locations.The soft drinks offered are sweetened with cane sugar, too. So check out my latest video for an up close and delectable hot dog jaunt to Let's Be Frank, where wieners are made with thoughtful humaneness and real flavor. Play it here. The video runs 3 minutes, 44 seconds. Helms Avenue parking lot, across from Father's Office, between Washington and Venice Boulevards in Culver City. Hours: Wed.-Fri: 11:30 a.m. - 3:30 p.m. weekends 11:30 p.m. - 4:30 p.m. 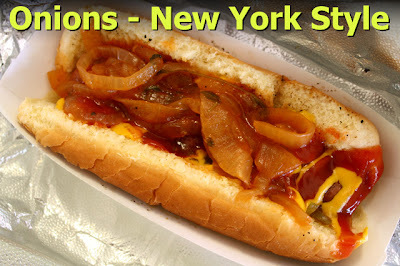 Hours: most Thursday nights: 5:00 p.m. - 10:30 p.m.
To find their latest hot dog cart locations on Twitter, click here. To embed, or to just link my video from Youtube, click here. The 99 Cent Chef's favorite fast food is the hot dog. A perfectly designed fast food delivery device. Is the bun steamed or grilled; is the hot dog beef, pork, turkey, or vegetarian? 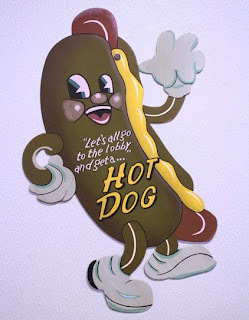 And the dog --is it steamed, boiled, flame-broiled, grilled or deep fried? 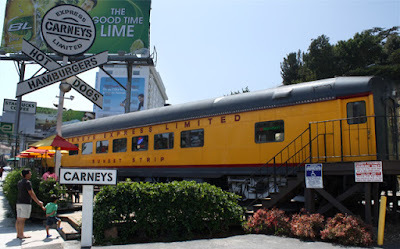 It seems so easy to do, and it is, but mistakes can be made along the way and I've tasted my share, usually at large music events, at the ballpark (Dodger Stadium) or the racetrack (Hollywood Park). 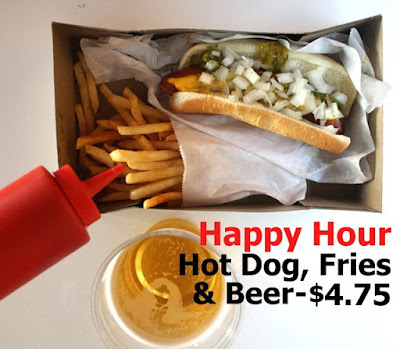 Too often these venues serve soggy buns filled with rubbery wieners; the watery relish is squeezed from a minuscule plastic pouch, and you’re lucky if the squirt bottles of mustard and ketchup are not empty! But don’t worry – the dog, done right, can still be man’s best friend. 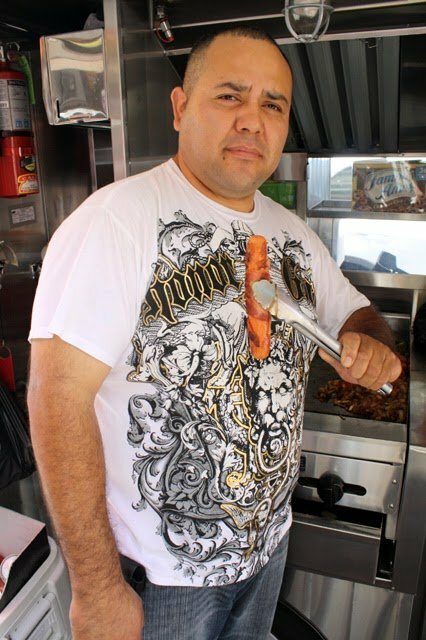 Welcome to August Hot Dog Month -- where The 99 Cent Chef serves up some of the best hot dog shacks and street carts in L.A. Every week I am cooking up a new video featuring my latest frank find. 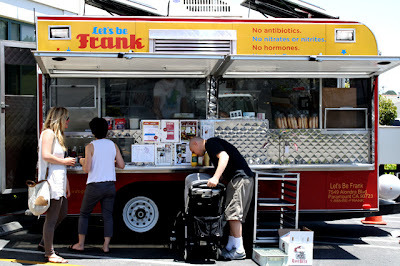 From the grass-fed, hormone free, beef and pork artisan made wieners of Lets Be Frank, to a funky fresh grilled hot link dog from South L.A.'s Earlez Grille. I even throw in a video recipe of the underground late night hangover vaccine: a bacon-wrapped L.A. Street Dog. First up is the exceptional Fab Hot Dogs, where chef owner Joe Fabrocini has brought virtually all of America to the San Fernando Valley, offering a menu of beautifully crafted dogs from every region worth its mustard. 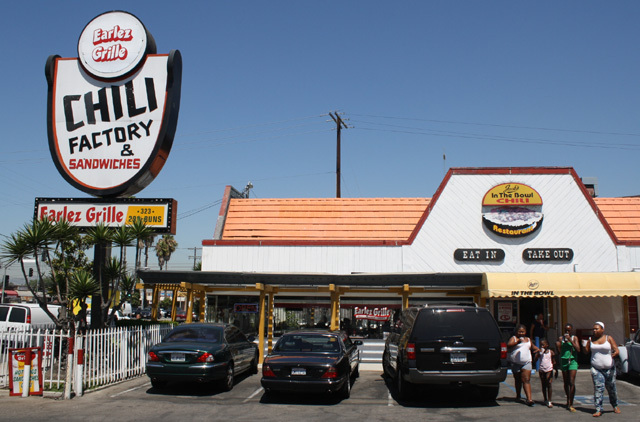 Recently relocated, Fab’s is in Reseda, in a corner store at Loehmann's Plaza, off the 101 freeway. Take the drive, it's worth it. 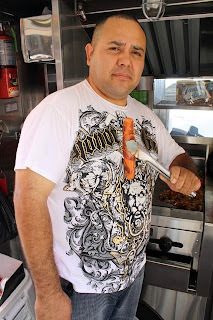 Chef ‘Fab’ earns his name as a master carpenter of the humble hot dog, blending premium ingredients and a devotion to research to come up with museum-piece tube steaks as carefully constructed as a Stickley piece of furniture. One look his Chicago Dog should give you the idea: behold the warm, rosy-red grilled frank topped with mustard, nestled in a black-speckled poppy seed bun, blanked by half wagon wheel slices of tomato, Day-Glo green relish, chopped onion, a wedge of pickle and two sport peppers, and finished with a sprinkle of celery salt. 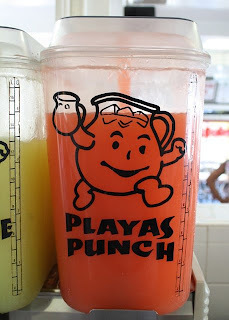 This is the real thing; just looking at it makes me shudder from the winter chill on a blustery, cloudy Chicago day. I could go on; Fab’s offers franks from many regions: there are deep-fried New Jersey Rippers, a Carolina Slaw Dog, a Kansas City Dog (BBQ sauce, grilled onions, shredded cheddar ), and a L.A. Street Dog (bacon-wrapped, with jalapenos, grilled onion and peppers). And for those who can’t leave well enough alone, Fab’s offers an array of extra toppings, including sauerkraut, chili, American cheese, New York red onion sauce, pinto beans and a unique tomatillo salsa. Ever had a New Jersey Ripper? It’s a deep-fried frank that splits after 6 to 8 minutes. Variations go by length of time in the fryer; there’s also the Weller (10-13 minutes) and the Cremator (20 minutes). 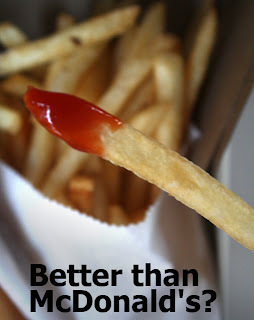 The technique renders a crunchy-skinned frank that is still tender on the inside. The wiener is shipped in from New Jersey, and is made to be fried without absorbing oil. 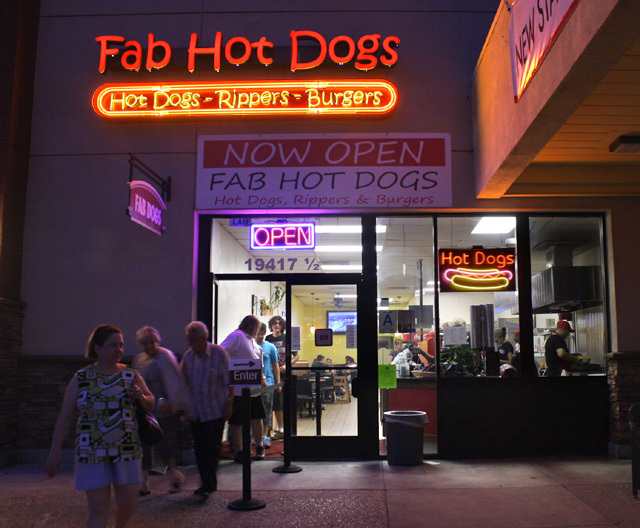 I hear Fab's has off-menu dogs, too, like a Teriyaki Dog with grilled pineapple, and a Monte Christo Dog with strawberry jam, Taylor ham (from Jersey) and melted Swiss cheese. You can also build your own. To see what I’m talking about, play my video, below, for in-your-face and bite-by-bite footage of some delectable dogs. You’ll also get impassioned commentary from the patrons and The Mayor of Fab's, plus explanations from chef Joe Fabrocini. And make sure to view the end, where the radioactive-looking green relish on the Chicago Dog sets off a comedic chain reaction in The 99 Cent Chef! Play it here. The video runs 5 minutes, 3 seconds. 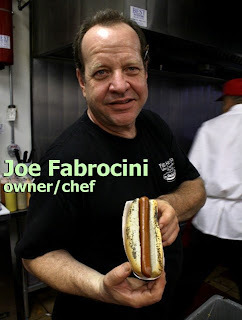 A big 99 thanks to Joe Fabrocini, his staff and patrons!